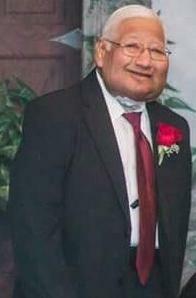 Felix Dominguez, age 70, of Orange, Texas, passed away on Saturday, April 7, 2018, peacefully, at his home. Funeral services, under the direction of Dorman Funeral Home, will be held on Friday, April 13, 2018 at 3:00 PM with visitation prior to services at 1:00 PM until service time. Felix was born on June 3, 1947, in San Angelo, Texas to parents, Esther G. Dominguez and Oscar M. Dominguez, SR. He had been a lifelong resident of Houston, Texas before moving to Orange, Texas where he lived for the past 10 years. Felix was of the Catholic Faith and a member of St. Mary's Catholic Church in Orange, Texas. He was a very loving, giving, good hearted man who loved his family dearly. He worked for United Structures as an Engineer for over 20 years before he retired. He was a very intelligent man and so delightful just to be around.When Felix was younger, he was a semi-pro bowler on teams that took him all the way to Las Vegas. He enjoyed bowling with his friends very much. He also enjoyed going to the casino to try out his luck when he could. Felix had four legged best friends, Coco, Jewels, and Shadow that spent many loyal, happy days with him, keeping him company. Felix was loved by everyone who knew him and will be greatly missed. Felix is preceded in death by Oscar and Esther Dominguez, SR., Oscar Dominguez, JR., and Chris Jones. Felix is survived by, Joe and Marcia Melchor, Andrea Martinez, Dalton and Allison Pezoldt, Russ and Ann Stevens, Danny and Ann Dominguez, Amanda Smith and Josh Baumgart, Jerry and Brittani Stanley. Their children Russell, Chloe, Madison, Mason, and Arielle.Sherry Jones, John Dominguez, Denisha Lowe, Damon Dominguez, Josh Coulter, Jeremy Coulter, Christian Jones, and Sheena Adams. He had no biological children of his own but was a father figure just the same. Pallbearers honoring Felix: Russ Stevens, John Dominguez, Joe Melchor, Jeremy Coulter, Josh Coulter, Danny Dominguez and Jerry Stanley.